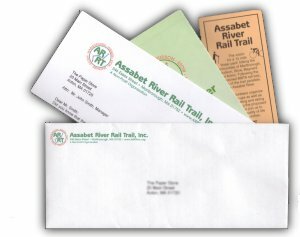 "A BIKE RIDE IN MID-AYER"
On Saturday June 8th at 9:30AM, the ARRT will be sponsoring an informal bike ride and fundraiser at the Nashua River Rail Trail. 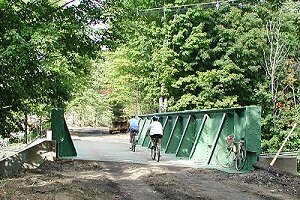 This brand new paved rail trail just opened in Ayer, and runs 8 miles north to Pepperell. Directions: From Boston, take Route 2, west for 22 miles to Interstate-495. Continue on Route 2 for 4 more miles and exit north on Route 110. Travel north on 110 to the rotary at Route 2A. Exit the rotary and travel west 1 mile on Route 2A to downtown Ayer. 2A takes a right turn in the center of town and then the trail parking lot will be on the right. Parking: The start of the trail in downtown Ayer has its own parking lot on Main Street. Overflow parking is one block south, next to the MBTA train station. Free ARRT T-shirts for donations of $10 or more, while they last. Rain date is Sunday, June 9th. For more information, call (508)485-8394 or (978)264-9022. 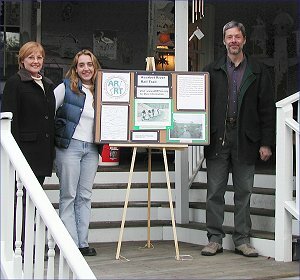 The ARRT fund raising event at Apple Blossoms Gifts in Stow was a success. Many thanks to all the trail supporters who came to the shop and made a purchase. Apple Blossoms staff and ARRT volunteer Mike Duclos close the shop at the end of the day. ARRT Fund Raising campaign kicks off! The ARRT's first ever corporate fund raising campaign will start in the first week of Janaury 2002. Donors will be listed on this page.